After a few years of training Capoeira*, I decided to head down to it's birthplace; Brasil, or as people not from there spell it, Brazil. "......When I mentioned.......my portuguese was primarily limited to capoeira terms...... he said "Oh, don't worry you gonna learn a lot... hahahaa".... and there began the journey........"
There are some truths to the preconceived notions of what Brasil 'is'. Warm smiling faces, incredible landscape, beautiful language, rich culture full of diversity are among them. I'll get back to the 'diversity' part a bit later. 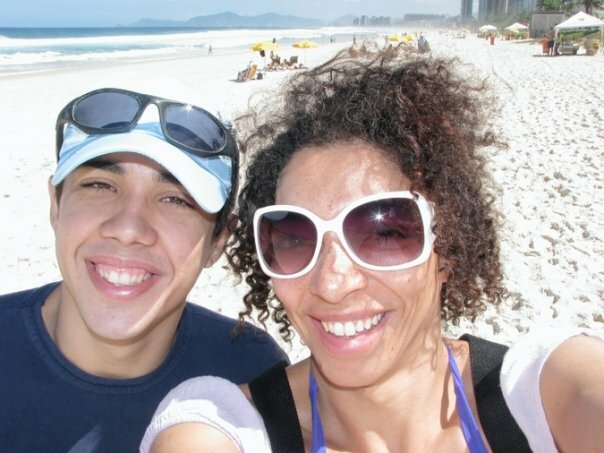 I landed in Rio, and arranged to stay with my friend's father and little brother in a suburb of the city. They picked me up from the airport, and with the help of both my translator app, as well as Aline's ("Aleen-ee") english speaking (little) brother, off we went. Riding along the coast not far past (west of) Barra De Tijuca, west of the cidade (City), was the warm friendly community called tijuquinha ("chee-zshu-keen-ya"---"Little Tijuca") where I would be staying. When I mentioned to Diogo (Aline's brother) that my portuguese was primarily limited to capoeira terms and pimsleur's portuguese 2, he said "Oh, don't worry you gonna learn a lot... hahahaa".... and there began the journey. ".....to my surprise in a predominantly BLACK city of Brasil...perhaps the most 'black' cities of Brasil we were the ONLY blacks sitting at a table in an extremely crowded (LARGE) restaurant. The only other 'brown' people in the entire place were the servers......"
We arrive in a village/neighborhood with tiny roads, full of people out and about. We get to Meneses' home (Aline's father) then take my stuff up the narrow steps to the room where I would be staying. It was a perfect warm sunny day (my favorite), but no need to open the windows since the side of the room facing the street didn't have a fully closed in wall. It was more a room with large windows always open (no glass). Completely protected from weather (rain), and likely one of my most comfortable rooms in the house. View from my window looking left along the wall of my room onto the neighborhood. Found this device on ebay. There are several affordable options (so you don't have to flash your expensive phone while traveling). Note: I don't recommend flashing expensive devices in certain unknown areas. do your research prior to your travels. This way you can familiarize yourself with any known issues regarding carrying things like expensive cameras, or flashy phones etc. Personally I do not dress 'flashy' while on the road, traveling may not be the time to sport your manolo blahniks (if you own such expensive things). Observe how local dress, do the same so you don't stand out nor draw unnecessary attention. Research the culture prior to going, so you have a better understanding of how to act as well as dress while out and about. ....."It was at that moment, even though I was sold all these stories about Brasil being such a cultural melting pot, it (Brasil) still had some progress yer to be made regarding the racial divide." A few days after staying in Tijucinha, I caught a local flight to Salvador Da Bahia, Home of my capoeira group, and the main port city where slaves were brought in by the portuguese from directly across the Atlantic (primarily from Angola, Africa). It's in Salvador, where I was truly shocked by what seemed to be a noticeable racial divide. Initially I stayed with my friend Lidiane (friend through the capoeira community) in an area just Northeast of the cidade centro called Itapua. My friend Lidiane connected me with someone who could take me to Lagoa Do Abaete. To thank him, I offered to take him to a nice restaurant. Mind you, I had yet to go to a nice (local's) restaurant. So, I was more than ready to try something really nice and NOT in a tourist area. I found what seemed to be a really nice area with a couple of mid range restaurants, but the guy showing me around didn't seem to want to go in. He didn't speak ANY english, so I though perhaps his reluctance to go in there had to do with his inability to pay. I said to him "Eu Pagar pra voçe" (I pay for you), but he still seemed nervous. We went in and sat down.....to my surprise in a predominantly BLACK city (Salvador) in the 'melting pot' of Brasil... we were the ONLY brown faces sitting at a table in an extremely crowded (LARGE) restaurant. It felt to me like I was dining in suburban Mobile Alabama! ".....When we turned the corner I saw a few guys holding a ton of large guns......one of them looked to me like a bazooka..."
After my time in Salvador, I went back to Rio and this time, stayed in the center of town with a friend Graziele (In Santa Teresa), as well as a couple of nights in a hotel in Ipanema (tourist central). One of my friends back in NY introduced me (through email) to a friend of his (Gabe) teaching in a favela. So, I took the Onibus down to the entrance of Rocinha. Remember that opening commentary when I mentioned I didn't bring my 'big' camera gear? Well, I started to put my point and shoot (Canon G12) in a grocery bag, the Gabe said: "you don't have to worry about your camera....." (no one is going to steal it)...."but when I say for you to put your camera away, please do....there are people that do NOT wish to be photographed..." About 3 minutes later Gabe asked me to put the camera away. When we turned the corner I saw a few guys holding a ton of large guns......one of them looked to me like a bazooka (sorry no photos.....). Learn some of the language (translations devices are KING! ), attempt to have conversations with people besides those with whom you travel. Go out some days on your own. Engage with people who live there and exchange your culture with one another. Yes, be a tourist & see the sights, but DON'T get caught up in the tourist only zone/s. Spend at least a few nights in a homestay and exchange one another's culture. New friends Georgiana (from England) & Luigi (from Peru) met them at a Hostel in Ipanema...our trip to Corcavodo. *'racial divide': I was utterly shocked at that experience in a nice restaurant (in Salvador). I can't pretend that one experience is a good judgement on an entire city, let alone a country. Yet I really didn't expect anything like that in an area I perceived as 100% equal. Since then I've mentioned this experience to my Brasilian friends and though it does seem to be quite a multicultural environment, they did share stories of racial tension at times. So, even in a land so culturally diverse, we (as humans) still have a long way to go. As a 'brown-traveler' in Brasil, I will say I felt I had an advantage blending in. That's not to discourage my non-brown traveling friends though....just learn as much of the language as you can, don't be 'flashy' & perhaps team up with a (new) local friend or friends then galavant OUTside the tourist zone.